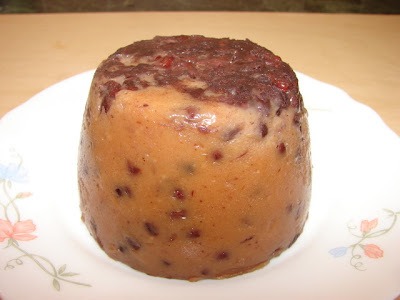 This coconut flavoured sticky cake/pudding with cooked red beans is another Cantonese favourite for CNY. I made some the other day but I have to say I much preferred the old fashioned plain brownish rice cake. Here is a recipe if anyone is interested. This recipe will make 2 puddings using 1/2 pint (about 250ml) pudding basins (metal or plastic) or other containers. Mix other ingredients together then gently stir in the cooked beans. Pour into 2 greased pudding basins or containers. Steam for 45 minutes to 1 hour. As you can see I have put some red beans on the bottom of the basin, I find it makes the bottom bit too soft and gluey, so if anyone trying this recipe don't do that, just mix all the beans into the mix.